On View from May 18 through June 28, 2012 at Gallery 151. 132 West 18th Street, New York, NY 10011. SLOW FOOD/FAST FOOD: “EAT WHAT YOU ARE” is a dynamic and captivating art exhibit that contextualizes the last 500 years of humanity’s relationship with food by juxtaposing still life art works of old world masters created in the 16th and 17th centuries with the contemporary work of artists today. What we find within this six-week-long exhibition is an introspective opportunity for the audience to reflect upon how our relationship with food has changed over time; a story told by the still life images created over the course of that relationship. In honor of this exhibition, Gallery 151 has partnered with Slow Food NYC, a non-profit, member-supported organization founded in 1989 to counteract the culture of fast food. Slow Food NYC works to create and support a food system based on the principles of high quality and taste, environmental sustainability, and social justice. Slow Food stands against the disappearance of local food traditions and people’s dwindling interest in the food they eat, where it comes from, how it tastes and how our food choices affect the rest of the world. 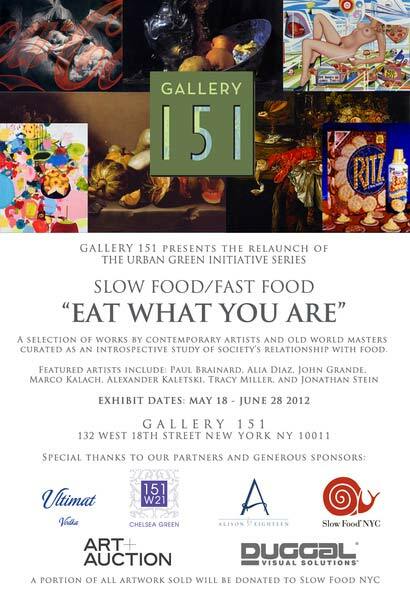 SLOW FOOD/FAST FOOD: “EAT WHAT YOU ARE” will showcase paintings, mixed media, photography, and sculpture. The exhibition will be open to the public from May 17 to June 28, 2012.